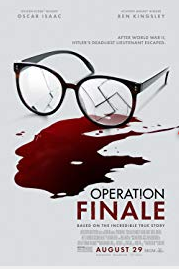 Based on a true story, Compelling, Suspenseful, Slow and Intriguing are the best ways to describe “Operation Finale”. The title of the movie is very fitting. Capturing Eichmann was a “Finale” for a lot of people who survived WWII. Ben Kingsley was stellar in his performance. If you can stand seeing the events of WWII Nazi unfold in front of you check out “Operation Finale”.